The most famous Bollywood awards, The FilmFares, was a great new year treat for its spectators. Apart from the awarding ceremony, the thing which everyone looks forward to at the filmfare are clothes worn by the celebrities. It's one big night for all Bollywood stars, especially for those who have been nominated for their role played in the preceding year's films. Everything from the red carpet to the witty hosts and beautiful star studded performances is wonderful about this award ceremony. 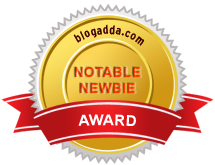 It's a grand event and the dream of every newbie in Bollywood. Like every year, I was looking forward to this award ceremony to get a sneak peak into the new styles the celebrities have bought to the red carpet. I was eager to see what Sonam would wear as she never disappoints with her choice. There's another actress I was looking forward to, the newbie celebrity kid of Bollywood - Athiya Shetty. She has made a sizzling entrance in the fashion world and it's not far before she grabs Sonam Kapoor's crown of being the 'Bollywood fashion icon'!! But guess what?! Turns out the other Bollywood stars were all pepped up and they surprised us with their style at the FilmFare, stealing the show. Alia Bhat, yes, I am talking about you!! Let's have a quick sneak peak into the top five best dressed Bollywood actresses at the Britannia FilmFare awards 2016! Alia has come a long way in both her acting skills and fashion sense, both improving by every passing day. She stunned in this Sachin and Babi high low dress which screams peppy and gorgeous. The most interesting thing about this look were her mismatch stilettos and bubbly hairstyle. Love! She was a total stunner, my favourite out of the list! Our style icon is always ready to amaze us. 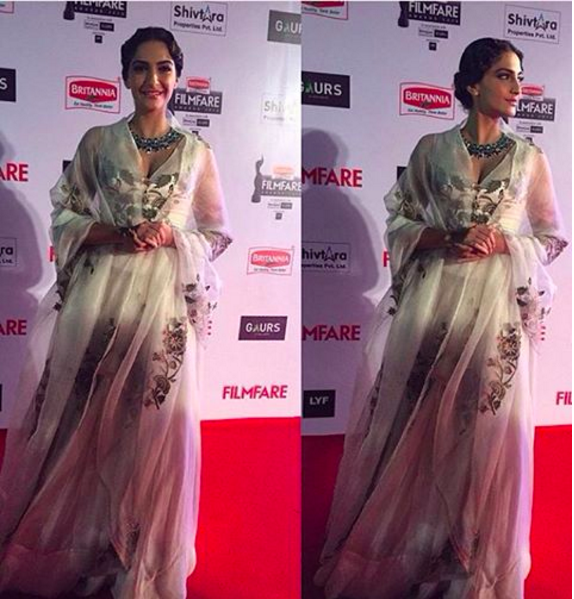 This another stunner by Anamika Khanna was perfectly styled by Sonam. Everything from the floral details to her style and makeup was simply perfect. She looked like a fairy just landed from heaven. Only she can do white so well!! Madhuri gave us her another stunning saree look. The powder pink and gold of the saree clashed beautifully with her skin and the back detailing of the blouse was simply a stunner! Her choice was from the designs of Abu Jani sandeep Khosla was a great one. Wish she had chosen a softer shade of lipstick though. The newbie Athiya Shetty sizzled in a Monisha Jaising long gown. Her side swept hair and signature ring made her the star of the show. The palm cuff ring by Yoube jewelry was a first at the red carpet and people LOVED it!! This beauty graced the red carpet wearing a stunning statement Migueli Zermiguel gown. The golds in the gown contrasted beautifully with the red carpet, making her look glorious. Her hair style was interesting and the makeup a bold choice which actually worked! I love how her skin is glowing! Which is your favorite look? 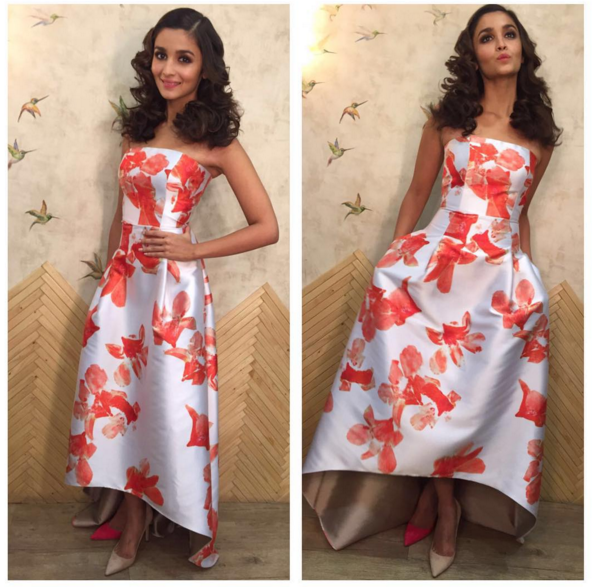 I am loving all of them, especially Alia Bhat's sweet and peppy look! !